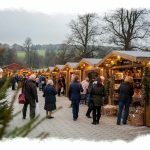 Chatsworth House Christmas Market gets better and better every year. The diversity of the stalls means there is something for everyone. With Christmas decorations, gifts, novelty items and a variety of food and drink it is venue to visit. You also have access to Chatsworth grounds, the stable restaurants and Chatsworth gift shops. Parking is included with all advance online bookings for Christmas in the house. Parking is also included for members of the Chatsworth Patrons and Gold Friends schemes, and for guests at the Devonshire Arms Hotels in Beeley and Pilsley and The Cavendish Hotel, Baslow, with their Red Chatsworth hotel ticket. Parking for Silver Friends is £4. This does not give you access to the Gardens and House but you could purchase tickets for that if you wanted by advance booking. Chatsworth also provides entertainment with a small band playing Christmas Carols and a Street Organ. In the Stable Restaurant a delicious Christmas Dinner that was generous in portion and very tasty and can be followed by a delicious cream tea, There are toilets and baby changing facilities at the back of the market and the coaches drop off and pick up at the end of the market stalls. It is well organised with plenty to do, see and buy. Tipsy Fruit Gins with their range of specialized Fruit Gins and Infused Rum.